What has happened to Joseph? Joseph was our guide on our tour of Syria five years ago, just before the outbreak of war. Since then I’ve often thought of him, hoping he and his family would be safe. He is average height, slight and looks like many others around the Mediterranean. Quiet and knowledgeable, he was keen to learn from us too. He was fascinated, at Palmyra, when I told him that an ornamental temple in the scenic gardens at Stourhead, England, was inspired by the ancient site at Palmyra, and John added that Robert Adam was also influenced by 18th-century engravings of this ancient Roman city. He was an excellent guide. shopping in the western-style clothing store we’d glimpsed on an upper floor in Damascus. When asked, Joseph told us a lot about himself, his family and country. He is a Mennonite Christian, and took us to churches. He tolerated President Assad because, although with limited political rights, Christians (and other minority groups) were free to worship and run their own school. That, he said, was so important that a loss of political rights was a price worth paying. In his turn, he asked us why we didn’t expel rebellious Muslim clerics from Britain – I’ve forgotten the one in question. We explained that everyone is equal under the law of our country and is innocent until proved guilty. He found that difficult to understand when the man in question could be encouraging terrorism. Aleppo. A fascinating city where we explored the massive fortress, the bazaars in the old city, and drove along avenues of fine early 20th-century architecture built with rose-tinted stones of the area and through open fields of ploughed red earth and silvery green olives. ‘There were once,’ he answered. He may have meant before 700 AD. The ruins of St. Simeon’s monastery were on an outcrop. The carving of the capitals was uncannily similar to those we had seen at Apamea. Thay was late Roman, the ‘Roman baroque’ period around 200 to 300 AD. Even later. The great grandsons of those stonemasons could have worked on this monastery. We stood at the edge with Joseph and looked north over the wild landscape where we could make out small clusters of buildings. ‘Wars,’ I suggested, as they were on the north-south trade routes. I can remember his words, and recall Palmyra and Aleppo as if I heard and saw them a few days ago. They are being ravaged as I write. Where are Joseph and his family now? 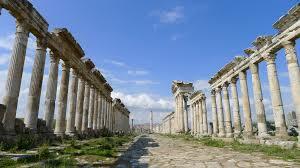 How lucky you are to have seen Syria when it still existed. I remember Afghanistan that way, as I drove all around the country, from Heart in the West, to Kandahar, Kabul, Mazari-Sharif and inland to Bamiyan, in 1970. Neither will ever be the same. Not the land. Not the people. Not the artifacts. They’re just memories and photographs. Sad. thank you for this memory, I hope Joseph is alive.